What story in the news is having the biggest impact on shaping the economic outlook of Affluent investors? The political climate; is there any other news story? As far as Affluent investors are concerned, the political climate thoroughly dominated the news in November. The Economy? The Stock Market? Unemployment? Interest Rates? Terrorism? Barely on their radar. An unprecedented 83 percent of Affluent investors surveyed by Spectrem Group cited the Political Climate as the news story having the most impact on shaping their economic outlook. Affluent investors’ focus on news stories regarding the political climate as it relates to their economic outlook has increased steadily through 2016. 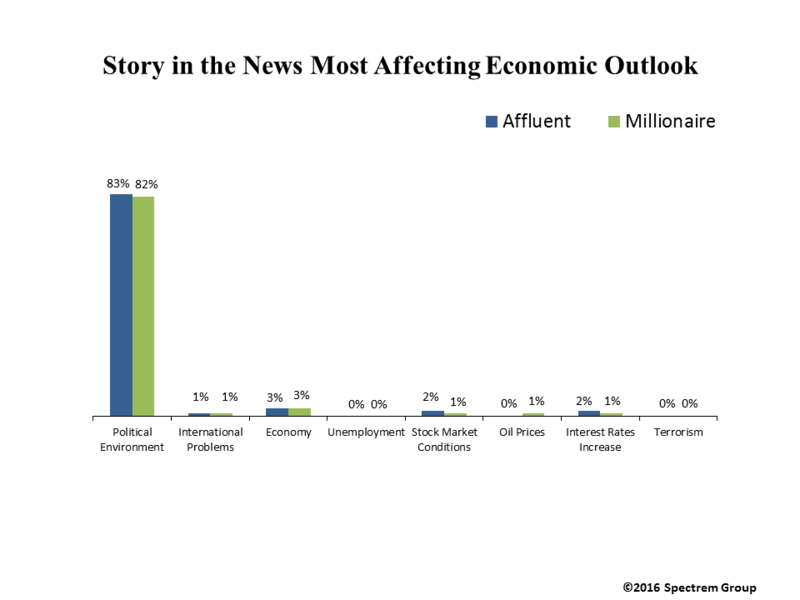 Last May, half of Affluent investors surveyed by Spectrem Group reported that news stories about the political climate were most affecting their economic outlook. Three months later, that percentage had increased to 61 percent. Prior to 2016, the two previous instances when a significant percentage of Affluent investors said that news stories about the political climate were most affecting their economic outlook were the November 2014 midterm elections when the Republicans gained control of the Senate and the House of Representatives for the first time in eight years and November 2012, when the White House and Congress collided over the fiscal cliff. The political climate became the filter through which other news stories were viewed. Some news organizations reporting on the President-Elect’s win raised the prospect of unease about the economy and the market. This uncertainty was reflected in an initial drop in the international markets. But by Friday, the three major market indexes posted their best weekly gains of 2016. The Dow Jones industrial average closed the week at a reported 5.4 percent, its best weekly performance since December 2011. The S&P 500 ended the week about 3.8 percent higher, its highest weekly gain since 2013. The Nasdaq gained 3.8 percent marking its best weekly performance since February. As Wall Street assesses Trump’s policies and considers the people he appoints to his cabinet and administration, another factor that could impact the markets is continued speculation on whether the Federal Reserve will institute an interest rate hike in December. The immediate months following the inauguration will present a clearer picture of how Affluent investors will react to Trump the president, as opposed to Trump the candidate. · Help your client stay focused on their financial plan (and if they don’t have one, communicate the benefits of creating one). At the same time, advise your clients regarding any possible actions they should take in anticipation of the possible changes occurring with the new administration. If tax rates are lower in 2017, should they be deferring any income? Is this a good time to make charitable contributions? The market is at an all-time high. Is it a good time to sell? Or wait until next year if they need to deal with large capital gains? This is a time to assess their portfolios in light of potential change. · Investors appreciate proactive communication from their advisor on matters that could impact their portfolio, Reach out to them to address any concerns they may have about recent economic and financial news and trends.